Afou Chantal Bengaly is a social justice activist, motivational speaker, trainer, moderator and youth mentor. She holds a doctorate in pharmacy from the University of Bamako, Mali and a master of sciences degree in International Health from the Jomo Kenyatta University of Agriculture and Technology of Kenya. She was the first woman from her home village of Kourouma to study at the university. Chantal served as a catechist for children ages 6 to 15 in her parish during her studies. From 2008 to 2015 she served the International Movement of Catholics students (IMSC-Pax Romana) as national program coordinator and later on as Africa regional coordinator. 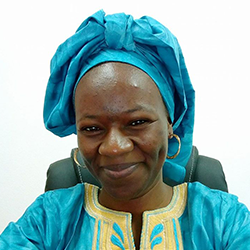 She currently works as program manager with Wetlands International Mali, a position she has held since 2017. She is also a counselor to the mayor of the municipality of Kourouma village located in the south of Mali. She contributed the chapter "From the Local to the Universal: Small Student Communities in Mali" to the forthcoming text God's Quad: Small Faith Communities on Campus and Beyond edited by Kevin Ahern and Christopher Derige Malano and published by Orbis Books, Maryknoll, NY. "I would like to express my gratitude to Fr. Fratern Masawe SJ and my husband Drissa Traore for their editing and support throughout this process." It is too easy to lament the condition of the world and, like the disciples, feel overwhelmed. Jesus says, ‘just bring me what you have and let’s get started.’ The conversion of the whole world will begin with me, with meager loaves and fishes. Jesus will surely multiply them; He will not fail.